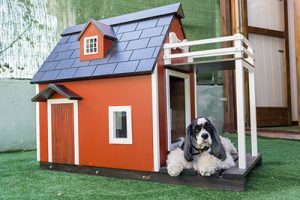 Most pet owners would think of outdoor dog houses when it comes to buying a house for your dog. However, there are also many varieties of indoor doghouses on the market. Most people would wonder why there is a need for indoor dog houses since your dog is inside the house. Some pet owners like to use it as a way to control the dog´s movements while others want their dog to have a home but not outdoors especially for smaller sized dogs. There are many types of indoor doghouses on the market using various types of materials such as soft indoor dog house. These look like gym bags with padding and have excellent ventilation. The padding gives your dog extra comfort. Some indoor dog house can also double as a pet carrier for small dogs. This is convenient for example if you have to go for a vacation and you can carry and leave the whole indoor doghouse with your friend or neighbor. Dog pen dog houses looks just like a dog kennel used in outdoor doghouses. They are usually made from steel with fencing. They are quite light and large allowing enough space for your small dog to run around inside it. They also provide good ventilation and enough space to pack in all your dog accessories such as their pet food, dog beds and blankets. Nowadays, there are also fancy indoor dog houses that look like a piece of furniture of end table. These are usually made of wood and can fit seamlessly into your home. The most common material is usually hardwood and can come in various colors such as espresso, antique black and cherry red. There is a wide range of prices for indoor dog houses. Depending on your budget, it can cost anywhere from $50 to a simple dog house to more than $500 for a fancy hardwood dog house that looks like a table.